Sierra Platinum - the first webserver for multi-replicate peak-calling. Vienna RNA Package - Folding and comparing RNA secondary structures. 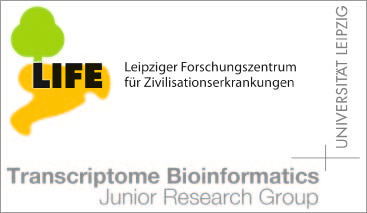 Ivo Hofacker, Christoph Flamm, Peter Schuster, Peter F. Stadler and many others. Stefan Washietl, Ivo L. Hofacker and Peter F. Stadler. aln3nn - Progressive multiple sequence alignment with exact three-way dynamic programming steps. Matthias Kruspe, Peter F. Stadler. barriers - Basin Structure of Landscapes. Christoph Flamm, Ivo Hofacker, Peter Stadler. BAT - A modular bisulfite analysis toolkit (BAT). It tackles the major tasks for analyzing bisulfite sequencing data. bbq - Discovering cis-regulatory modules. CartProduct - Creates Cartesian product graphs and decomposes given graphs into their prime factors w.r.t. the Cartesian product. Christian Otto, Steve Hoffmann, Jan Gorodkin, Peter F. Stadler. codaln/code2aln - Progressive Multiple Alignments of Partially Coding Sequences. Roman Stocsits, Ivo.L. Hofacker, Claudia Fried, Peter F. Stadler. creto - A program for the determination of Cis-Regulatory Element Turn-Over rates. cycdeco - Calculates a minimum cycle bases, the set of relevant cycles, the set of shortest and unique shortest and essential cycles, the interchangeability classes of relevant cycles for undirected unweighted graphs. cyclope - cyclope is a command-line tool for multiple circular sequence alignments. fragrep - Efficient Search for Fragmented Patterns in Genomic Sequences. Axel Mosig, Katrin Sameith, Peter F. Stadler. Christian Hoener zu Siederdissen et al. HelixPSO - A Particle Swarm Optimizer (PSO) for RNA secondary structure prediction. Kinwalker - An algorithm for prediction of RNA folding trajectories. Dominic Rose, Jana Hertel, Kristin Reiche, Peter F. Stadler, Jörg Hackermüller. NetwPartLearn - A simulation tool for reverse engineering of genetic networks in case not all gene expression levels are known before transition. pwmatch - Recognizing Position Weight Matrix hits in a sequence. RNAmicro - Recoginizing microRNA Precursors in Comparative Genomics. Jana Hertel, Peter F. Stadler. RNAplex - RNAplex is a tool especially created to rapidly search for short interactions between two long RNAs. RNAsnoop - RNAsnoop is a tool especially designed to search for putative interactions between a H/ACA snoRNA stem and a list of target sequence. RNAstrand - Predicts reading direction of structured RNAs in multiple sequence alignments. SnoReport - Computational identification of snoRNAs with unknown targets. Jana Hertel, Ivo L. Hofacker and Peter F. Stadler. StrongProduct - Decomposes given graphs into its prime factors w.r.t. the strong product.